Thank you to everyone who contributed to Week 3 of 2015. Each and every post was interesting and well-written but my personal favourites amongst this week’s posts were the State of the Art in Medical Education by John McCulloch on the TaysideHealth blog, and #thisgirlcan: a real women campaign that helps get women into sport by Emma Rodgers on the comms2point0 blog. 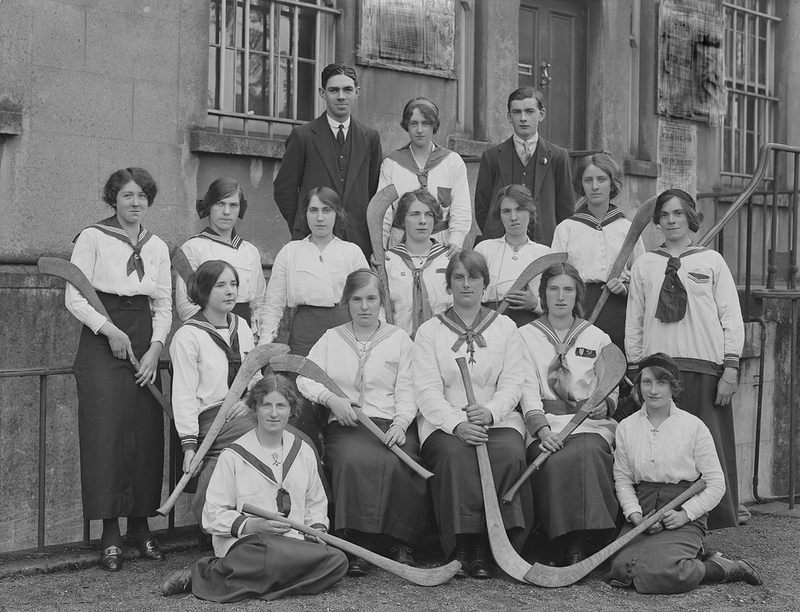 A team of camogie players in 1915, from the National Library of Ireland. I had contributed to the discussion Emma had before she wrote her post on the #thisgirlcan campaign. It had coincided with my return to formal exercise after 5 or 6 years of ill health. The first session in the gym made it painfully clear how much flexibility and muscle strength I have lost over those few years, and I am far from being the vision of energy shown on the #thisgirlcan advert. I am one of those who felt uncomfortable with a couple of the phrases or words used, including “girl” for a campaign that seemed to be aimed at women, but I think it excellent in showing women of various shapes and sizes doing fun physical exercise without worrying what they look like. The music videos in the (local authority) gym tend to show young, impossibly-shaped women wearing more make up than clothes – which do not help to inspire me. Incidentally, for those (like me) who had not come across ‘camogie’ before, it’s a game similar to hurling. As both an artist and an art historian (specialising particularly in 19th and 20th century) I found John McCulloch’s post about arts therapy and its role in medicine today very interesting. I got my highest exam marks in my BA finals in the psychology, psycho-analysis and art paper but it is only in recent years that I have started to think about the positives of arts in other areas of health. I have a tablecloth with brightly coloured embroidered flowers on it that my grandfather made when he was ill (probably when he was in hospital) during World War 2, when he was in the RAF. Embroidery was one of the standard arts and crafts therapies for servicemen at that time. I’m aware that arts therapy can help to get muscles working again, or to help people communicate. It would be great if all students training to be doctors and qualified doctors could see and understand what a difference arts therapy can make to a very wide range of people. I must get back into blogging regularly. That too can be quite therapeutic! If you want to join in, just tweet the link of your post to @weeklyblogclub. More about contributing can be found on our About page. Have a rummage around on our website for ideas to inspire you if you can’t think what to write. State of the Art in Medical Education by John McCulloch on the TaysideHealth blog. My home assessment by Laura Holmes on the Ayrshirehealth blog. Children and Young People’s Rights and Participation in Pembrokeshire by Rose Davis on the Good Practice Exchange at the Wales Audit Office blog. #thisgirlcan: a real women campaign that helps get women into sport by Emma Rodgers on the comms2point0 blog. NEWS LINE: What I Learned on the Guardian Public Leaders Editorial Board by Dan Slee.